Keith Wilson was raised and educated in Tauranga, and has been a resident of this fine city since 1950. Keith was initially involved with the building industry, leading to becoming the owner/director of a local construction company. Keith qualified to become a real estate salesperson in 1992 and, as a then resident of the country community with a passion for rural living, he decided to enter the rural sector of real estate, specialising in the sale of lifestyle blocks, orchards and including large drystock and grazing units. Graduating from Massey University in 1998 with a Diploma in Business Studies (Real Estate), he then became a 50% owner of a local rural real estate office. Over the many years in real estate, he has been a recipient of numerous high achievement awards resulting from his performance based sales. 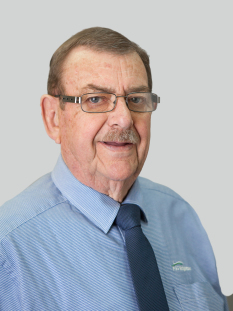 Due to PGG Wrightson Real Estate’s high profile in the rural sector, Keith accepted an offer to join the company in 2000 and has continued to maintain his proven sales record with them since that time. As a university graduate and qualified as a principal in real estate (AREINZ), Keith has established a high level of ethical standards. His vast experience in all facets of rural marketing of a wide range of properties means he is adequately qualified to assist both vendors and purchasers in the procedures to achieve a satisfactory result in their desire to sell or buy. Keith has built a strong client base and has conducted repeat business with a number of clients, many of those becoming personal friends. With an extensive local geographical knowledge, a wide range of associates and many years of productive rural sales, you would be well advised to consult with Keith in any matters relating to the rural real estate market.